The first phase of the Kaaterskill Rail Trail is a 1.5 mile section of the abandoned Ulster & Delaware Railroad between the Mountain Top Historical Society property in Haines Falls and DEC land at the end of Laurel House Road. The trail is open to public use for non-motorized, multi-use activities. Phase 1 of the Kaaterskill Rail Trail starts at the Mountain Top Historical Property on the former Ulster and Delaware Railroad, leaves the rail bed and travels along North Lake Road to Featherbed Lane, where it rejoins the rail bed. The trail ends at Laurel House Road, just above Kaaterskill Falls and close to the North-South Lake State Campground. A large portion of the trail is along the edge of Kaaterskill Clove, offering multiple views of Kaaterskill Falls, more of which will be opened up in the future. Creating a link from Haines Falls to the North and South Lake Campground along the old railroad has been envisioned for years by many in the community. Given the rich history of the railroad and grand hotel era of this region, the project offers great potential to interpret the natural, historic and cultural resources that have been the hallmark of the northern Catskills for generations. Phase 2 of this project, which is currently in the planning stages, will provide a direct link to the existing Escarpment Trail and the North/South Lake State Campground with a trail and bridge at the Laurel House site. If you have any questions, need additional information or would like to get involved in working on completing the KRT, please email [email protected] or call 518-628-4243. You can also get more information on the Friends of the Kaaterskill Rail Trail Facebook page. Driving Directions From the North: Exit 21, I-87, NYS Thruway. Make left onto Rt. 23B, follow sign for Route 23. Make left at McDonalds. Take Route 32 to traffic light at junction of Rt.23A. Make right, heading towards Palenville. After the light in Palenville, travel 4.5 miles to reach MTHS Campus and KRT Trailhead is on the right. Driving Directions From the South: Exit 20, I-87, NYS Thruway. Left at exit , then right onto NY32. Bear left at NY 32A (blinking light) then left onto NY 23A at the light in Palenville. Travel 4.5 miles to the MTHS Campus and KRT Trailhead on the right. 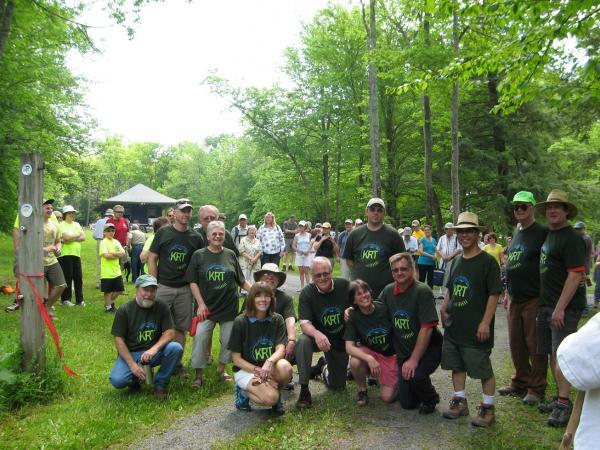 In addition to our volunteering, the Trail Conference needs your donations to keep our Catskill Trail programs running so we can continue to support efforts like the Kaaterskill Rail Trail. Our staff support volunteers in the region and we provide materials, training and supplies for our crews and volunteers. If you are unable to volunteer on a crew, adopt a lean-to, or adopt a trail for maintenance, but still want to help the Trail Conference continue our work in the Catskill Mountains, please consider supporting our Trail Programs in the Catskill Mountains by donating to the Trail Conference and your donation will be put to work on the trails, lean-tos and bridges of the Catskill Mountains and Catskill Park. 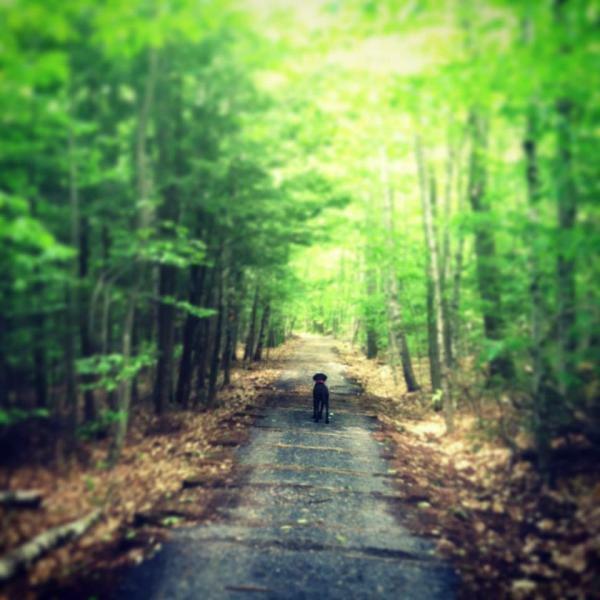 JUNE 1, 2013, HAINES FALLS, NY: Today, Catskill trail users have a new trail to explore in the Town of Hunter, and it’s a great one for families and those who enjoy an easy walk or bike ride with some great views. 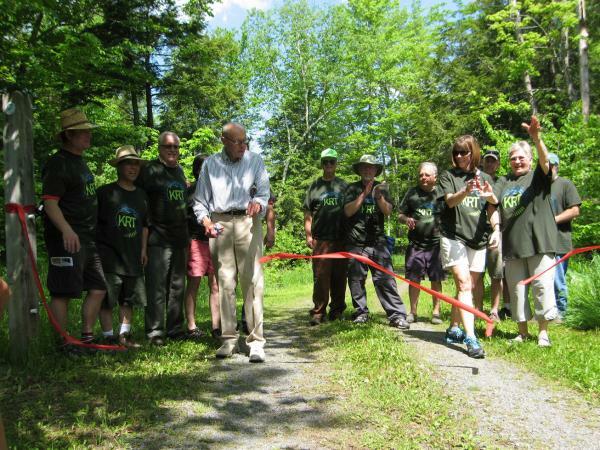 The Kaaterskill Rail Trail (KRT) grand opening was celebrated by 100 supporters and interested outdoorspeople on National Trails Day, Saturday, June 1 at the Mountain Top Historical Society in Haines Falls. Local residents have been advocating for this community trail for decades. They, along with visitors from near and far, enjoyed kick-off ceremonies, guided hikes, presentations, and a free BBQ at the Historical Society to celebrate the trail opening. Families were able to walk the trail for the first time and hear about the rich history of the railroads and tourism dating back nearly two centuries. Creating a rail-trail link from the Village of Haines Falls in Greene County to the very popular, nearby North and South Lake Campground has long been a dream for many in the Catskills community. Given the rich history of the railroad and grand hotel era of this region, the project offers great potential to interpret the natural, historic, and cultural resources that have been and continue to be hallmarks of the tourist economy in the northern Catskills for generations. This first completed piece of the trail follows the abandoned Ulster & Delaware Railroad between the Mountain Top Historical Society property in Haines Falls and New York Forest Preserve land at the end of Laurel House Road, just above Kaaterskill Falls. A large portion of the trail is along the edge of Kaaterskill Clove, offering opportunities to create multiple views of Kaaterskill Falls. The trail will be open to public use for non-motorized, multi-use activities. Phase 2 of the project, currently in the planning stages, will provide a direct link to the existing Escarpment Trail and the North/South Lake State Campground, with a trail and bridge at the Laurel House site. Partner agency representatives were on hand for the ribbon cutting welcoming the newest family trail addition in the Northern Catskills. The Unit Management Plan amendment update for the Kaaterskill Wild Forest was signed two weeks prior, with DEC’s full support for designating the KRT as a public trail. Phase 2 will include a pedestrian bridge over Spruce Creek, 200’ upstream of Kaaterskill Falls, that will allow access to the Escarpment Trail and the N/S Campgrounds.